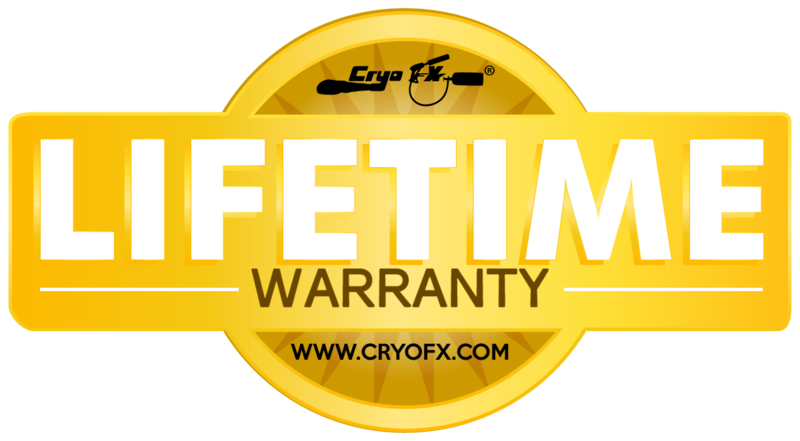 The world famous CryoFX® Handheld Cryo CO2 Gun is by far the most sought after special effects co2 gun in the industry. Currently in the hands of over 30 of the worlds top 100 DJs and having made appearances in Movies, Music Videos, Live Touring Performances, and Special Effects Worldwide, the handheld CryoFX® Cryo CO2 Gun is a symbolic icon around the globe. 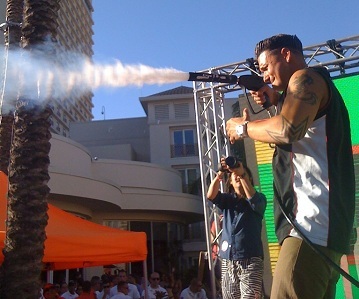 Now you can create your own special effects with the Handheld CryoFX® Cryo CO2 Gun. • Handheld Cryo Gun (CO2 Cannon) with attached 10" inch nozzle and attached quick disconnect fitting. • CryoFX® very own brand of High Pressure Co2 Hose with attached quick disconnect fitting. • Manual, Safety Guidelines, and FAQ (Frequently Asked Questions). • LIMITED LIFETIME WARRANTY AGAINST OPERATIONAL/MECHANICAL DEFECTS. The Handhenld CryoFX® Cryo Co2 Gun, one of CryoFX® best sellers, is the perfect addition to any DJ system or mobile production. Have complete flexibility and maneuverability with CryoFX® Cryo CO2 Gun. Requiring no electricity and weighing only 2.7 pounds (1.2Kg), this CO2 Cryo Gun is extremely lightweight and has the ability to be used almost anywhere. Add a new element and a huge surprise to any show. Incorporating easy connections and including CryoFX® very own brand of High Pressure Co2 Hose, along with a step by step pictorial user manual, you will be ready to use this CO2 Cryo Gun in minutes, pending you already have CO2. Measuring only 20 inches (50.8cm) by 9 inches (22.86cm), CryoFX® CO2 Gun is small in size which makes it easy to carry. CryoFX® CO2 Cryo Gun has the capability to spray CO2 clouds 25-35 feet (7-10 meters) or more. With options available such as; Custom nozzle colors, custom hose lengths, custom nozzle lengths and nozzle widths, and much more, that unique touch for your CO2 Special Effects Gun is just fingertips away. Simply call or email us for your custom order! Comes with limited lifetime manufacture warranty!